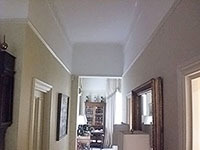 The Notting Hill Plasterer was called to this popular Notting Hill street to quote for a ceiling repair as part of an insurance claim. The area was carefully sheeted up to protect the existing paintwork & our professional plasterer squared up the ceiling hole to allow for a neat repair. 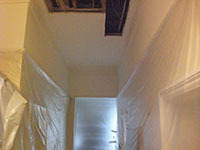 The ceiling was then leveled up using wooden battens, before plasterboarding the exposed area. Next our plasterer skim plastered the affected area taking great care to ensure for smooth joins with the existing ceiling. When finished it was almost impossible to see the area that had been repaired. another successful job for the Notting Hill plasterer.